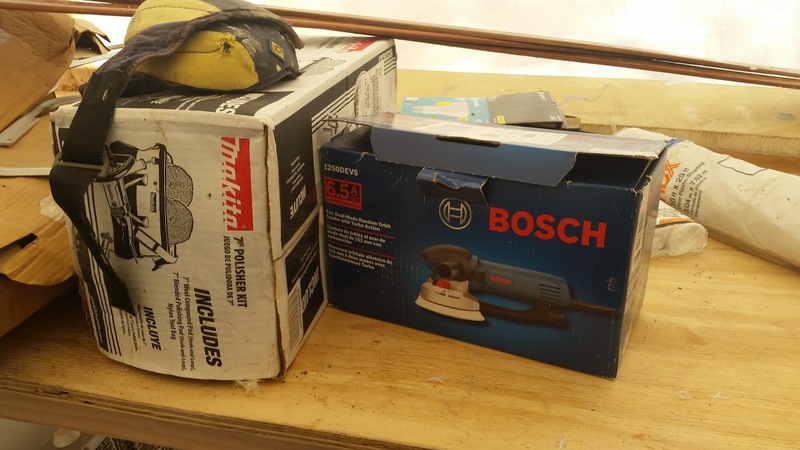 I played Santa to myself and got a new, more powerful 6" random orbital sander made by Bosch, plus a variable speed polisher by Makita. My old 5" Makita palm sander, which is lighter, will be used for vertical surfaces and tighter spots. 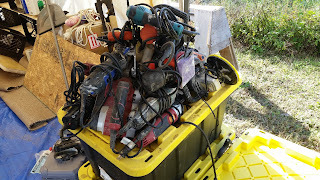 In retrospect I would have bought the Festools line of power tools from the start of this boat-building project, as a kit. Once you use good tools on a big project, you appreciate the better quality stuff. One of the problems I'm having is that the previously-applied primer is peeling off certain sections of the deck where there's a yellow material beneath. Not sure what that is, perhaps some sort of filler/fairing compound? Whatever it is, it absorbs moisture and causes things painted over it to peel off. In a way, leaving the boat for 15 months with the primer on was a good idea because it exposed such weaknesses -- had I painted over this stuff, the paint would have peeled off too and I would have had to completely re-paint the deck in a short while. So I'm glad I caught it. But now I have to chisel away the peeling primer and sand off the yellow stuff until I get to bare fiberglass. I am also finding damaged gelcoat that needs addressing. Fixing this was a small job that I finished between thunderstorms despite the cold, though I did resort to using a heat gun to carefully warm up the fiberglass resin and to make sure it set and cured correctly. The drains can now be cleared with my pinky-finger. Basically the project consisted of cutting out the old drain tubing, drilling the drains holes larger (3/4") and putting new drain tubes in place that were larger diameter (3/4"), shorter and more vertical. 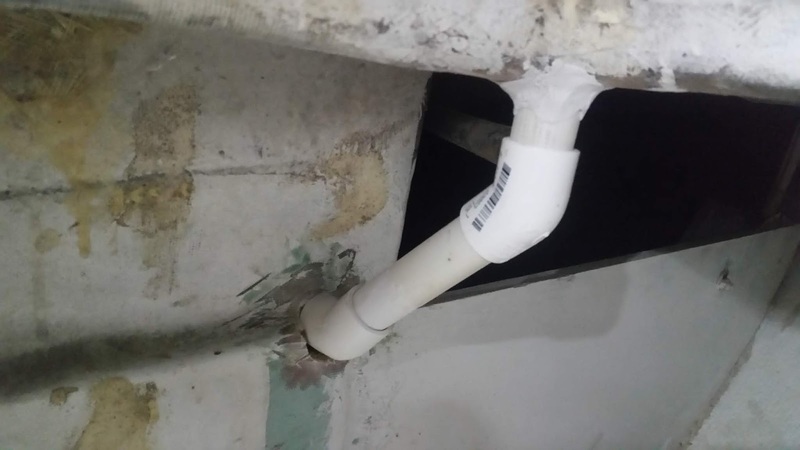 I used PVC pipes as the drain tubing. PVC can bond well to fiberglass especially if you sand it a bit and pass a flame under it, to get rid of the slippery glossy surface texture. 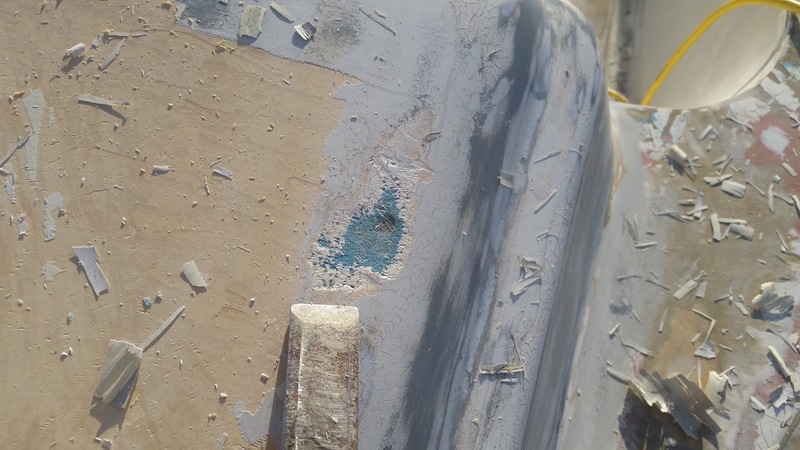 Wiping down the PVC with acetone further improves the bond with fiberglass. Cleaning the bilge and waiting for better weather. It has been an unusually cold and wet December this year. 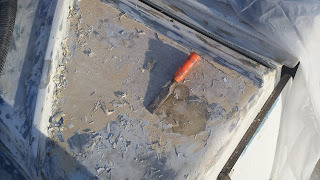 This has caused some delay in my projects since it is either too humid or too cold to do any fiberglass work. With daytime temps below 60, fiberglass won't cure -- and then humidity and dew will ruin any fiberglass work. But there are enough interior projects to keep me busy... like cleaning out the bilge. 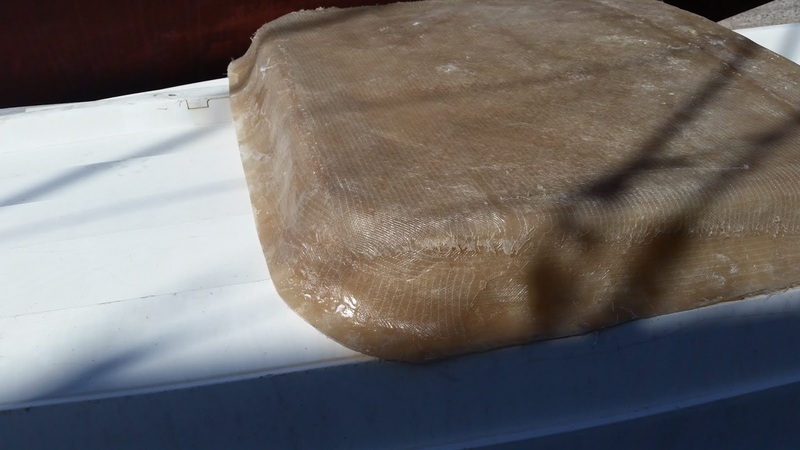 About 20 gallons of water had accumulated in the bilge during my 15-month absence. I believe this was due to the cockpit seat drains getting plugged-up, so one of my first projects was to enlarge and improve the drains -- more on that later. I will have to thoroughly clean the bilge and prepare the surface for gel-coating, to protect the interior fiberglass from the water and also to be able to more easily spot any oil etc.- accumulating in the bilge. Keeping a clean bilge on a sailboat is important because that's where the bilge pump is located, and the bilge pump is what removes any water that manages to enter the boat. Bits of dirt or debris in the bilge can interfere with the proper functioning of the bilge pump and/or the bilge pump's automatic switch. However this is a messy, dirty job, what with the dead frog and all, and it is really difficult to reach into the nether regions of Whimsy to give her a good scrub. 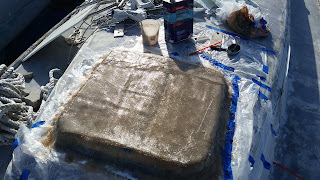 Sanding down the surface is an important part in prepping for gelcoating but I can't really reach all the way to the back of the bilge and beneath the engine by hand. 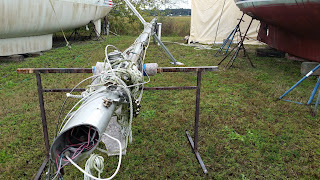 Bilge hose check valve, must go! One of the interesting finds was the one-way check valve on the bilge pump hose. 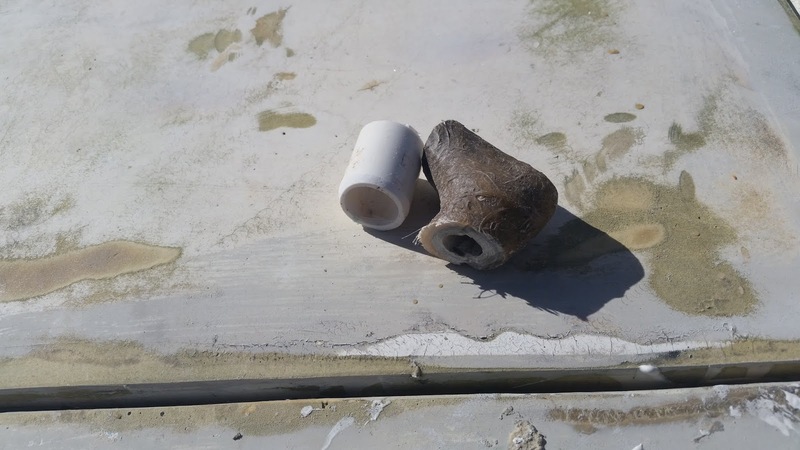 That's a no-no nowadays because should a piece of dirt get stuck in the valve, or if the valve just fails, seawater can potentially enter the boat through the bilge pump hose. I'm going to have to address this and the location of the fittings later. For now, I'm just cleaning the bilge in preparation for painting while the weather is bad. 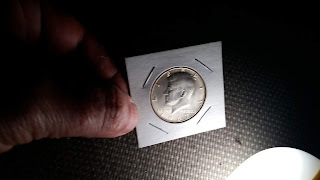 I got a 1967 silver Half-Dollar to go under the mast, as tradition requires. The coin has a portrait of President Kennedy, and was stamped the same year as the boat was manufactured. Unfortunately I'm a long way from raising the mast ... but at least I'm ready when the time comes. 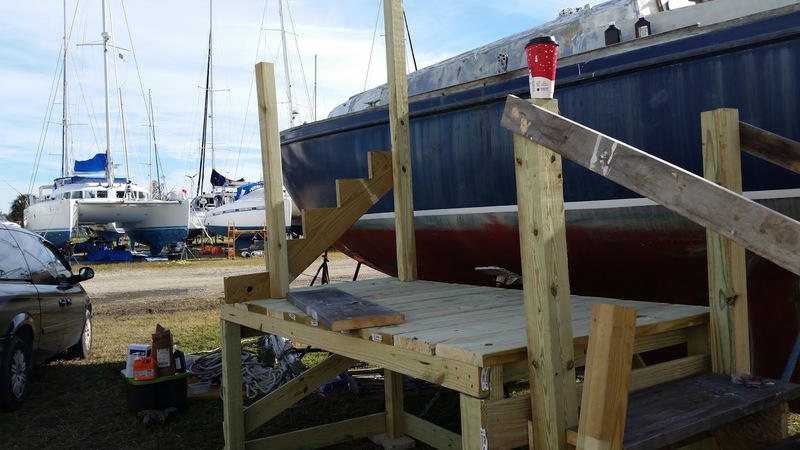 The mast will require a complete re-wiring and I plan to put some folding steps on it so I can climb the mast more easily/safely once at sea. The halyard winch will also have to be lubed and serviced, radar and lights installed, and I have to arrange for the lines to go aft into the cockpit...etc etc..
My fat, useless NYC apartment cats are getting used to the boat and boatyard life. This is the second time that they're here in Florida on my boat. so they were familiar with the arrangement from their first visit last year. 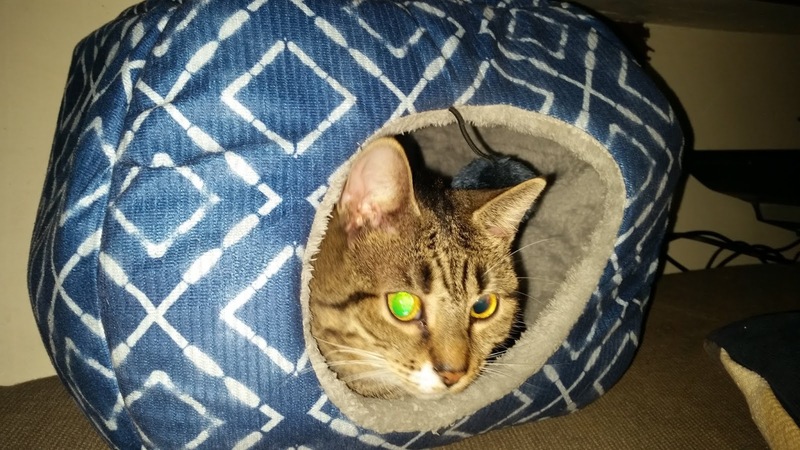 Upon arrival, they initially ran off to hide in their favorite spots onboard but gradually started adjusting...well, Pasha more so than Sasha. 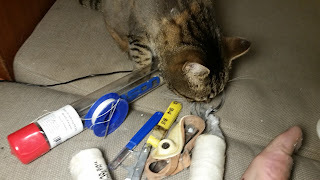 Pasha has started to wander around the boatyard and has even brought home a couple of "presents" for me: half-dead, Florida boatyard-sized cockroaches that he placed on my pillow while I was half-asleep. Exciting things happened after that. But yesterday he brought home a little bird too. I was kind of proud of him, and happy that his cat instincts were still sharp enough. I'm hoping the little bell on his new collar will prevent any more successful bird-hunts. 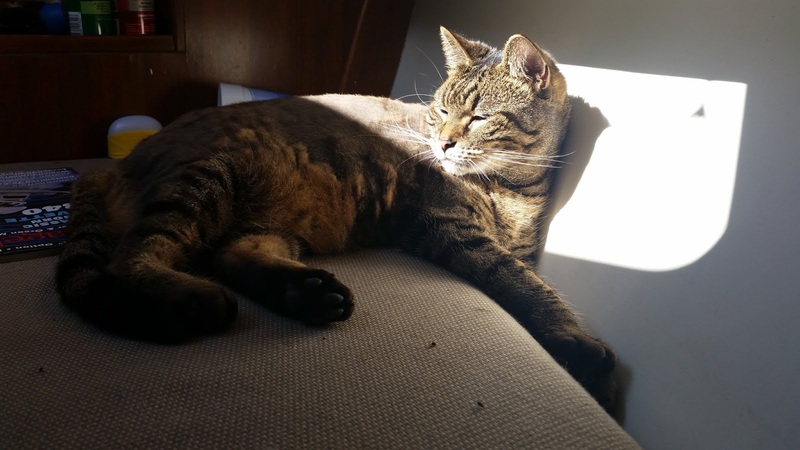 Sasha is another story. She refuses to got out of the cabin, and only lounges on a settee all day, demanding food and regular petting sessions. She's gotten quite fat too; I am concerned she may be diabetic so I've decided to cut way back on the dry food for both of them, and will perhaps switch to human food with more protein for her. I once caught a catfish for them which they ignored. 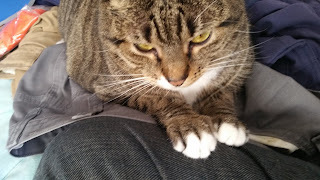 I can't carry a lot of canned catfood witth me once at sea, so they're going to have to learn to eat fresh fish too. I have been encouraging them to get around a bit more by moving their food plates out of the cabin and into the cockpit, along with their litter box, but the wet weather has not been cooperating - rainwater gets into their litter. 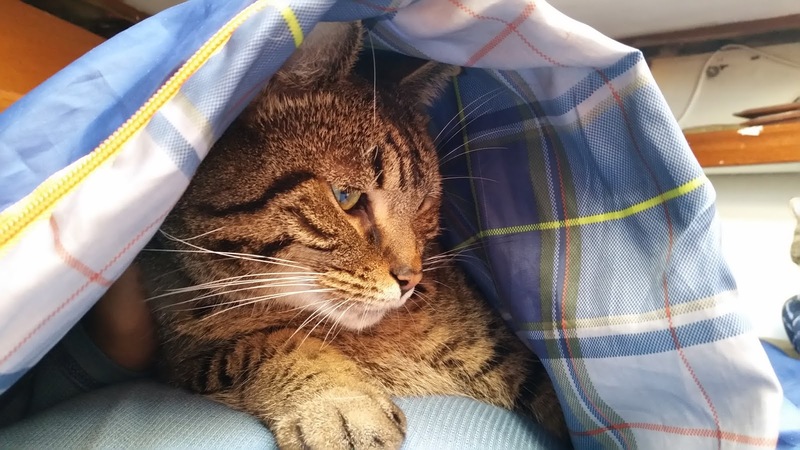 On dry days, Sasha is willing to go out to eat and use the litter box, but will rush back inside the cabin again. I got them each their own little plush cat house so they have a place to stay warm and feel secure too but when the temperatures fall, they prefer to climb into the sleeping bag with me, and since they're warm and fluffy, I don't mind either. It has been quite chilly for NE Florida recently. 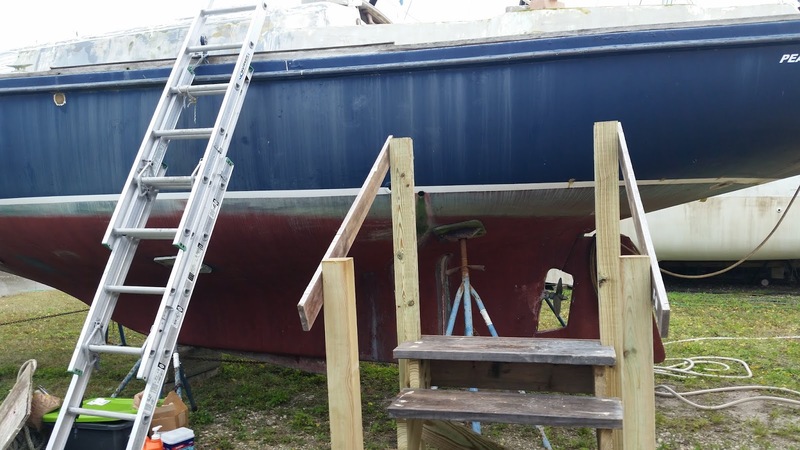 When you're re-building a boat while "on the hard" (not in water), you have to climb up and down a boat ladder many, many times a day. 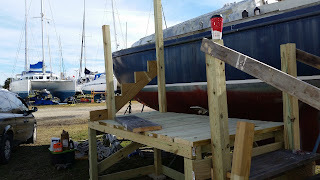 I was sick and tired of the climbing, and it was also dangerous to do so while carrying heavy tools (or my cats) so I decided to build more permanent stairs out of lumber. 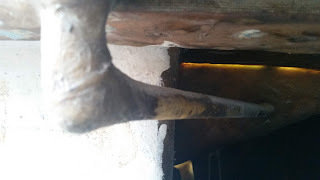 The boatyard had some stairs available but they were rickety and rusted with sharp bits poking out. Building my own stairs meant I could design them as I preferred too. This consists of two flights of stairs, with two platforms. Since most of my tools were still in storage, I bought a cheap circular saw and drill from Harbor Freight to get the job done. 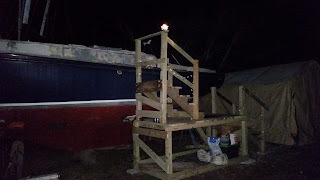 I also placed some rechargeable solar lights on the handrails to light-up the stairway at night. 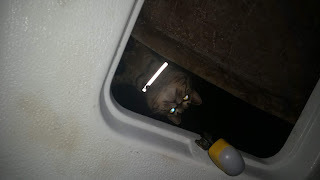 In addition to being able to climb to the boat far more easily, now my cats can climb down the boat to go exploring too. 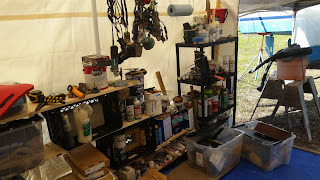 I bought another portable canopy/tent, about 10 feet by 20 feet, as my workshop. 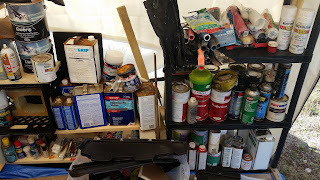 My previous workshop was also built using the same portable canopy brand but I shared the space with my friends in the yard, and I generally didn't like the feng shui of the interior arrangement, so I decided to improve on that. 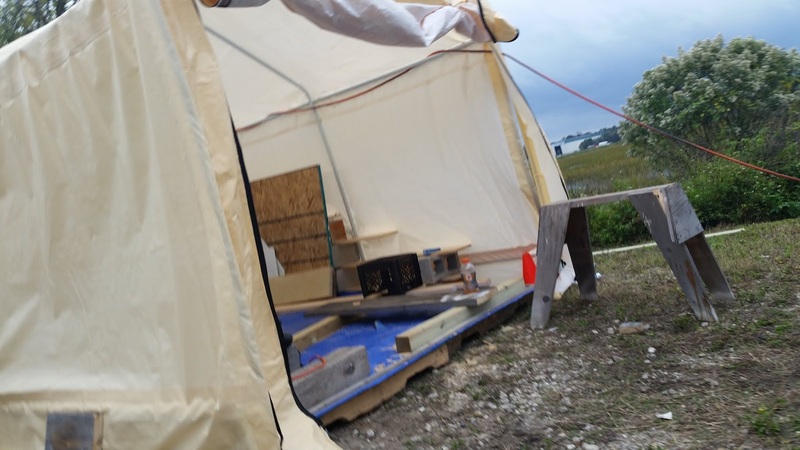 This time for example, the floor is not bare ground that flooded easily; I built it on wooden palettes covered with plywood and a tarp. 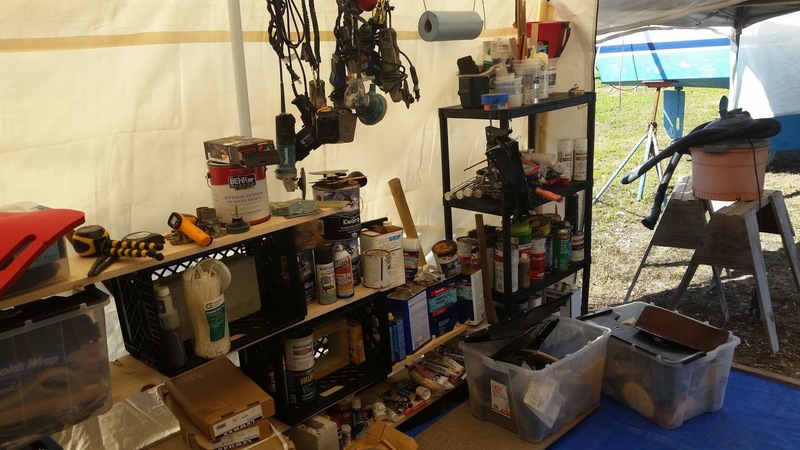 I also arranged my tools and supplies better this time around, and I got another portable 10x10ft collapsible canopy to use as an exterior workspace, protected from the rain. The shelves are built out of planks on milk crates -- much like in my college days. I also have my "kitchen" in the tent including the fridge and the electrical stove. Previously the kitchen arrangement was divided between the tent and the boat interior, which made cooking anything a bit of a hassle. 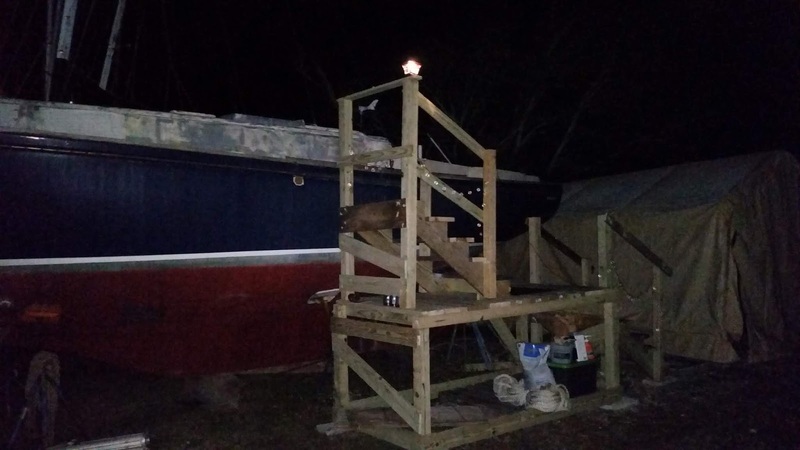 After I get my tools and supplies out of storage and arrange them properly, my first project will be to build some stairs to climb up to the boat. No more ladder! 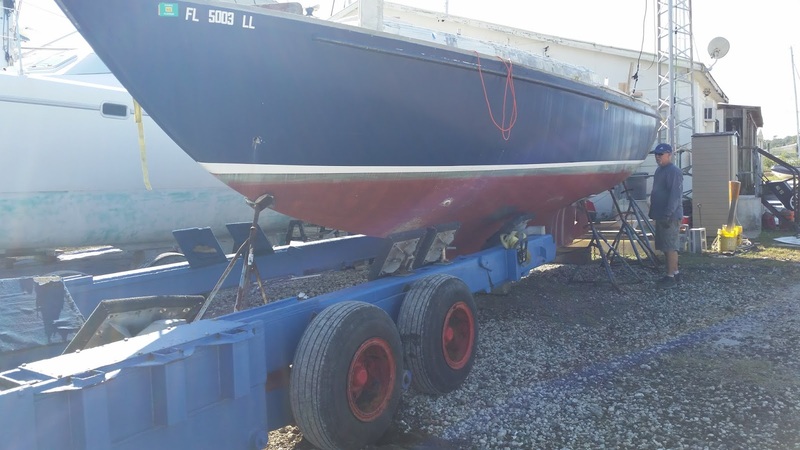 Back in the yard, back to work on the boat! After an absence of 15 months, I am back in the yard and back to work on the boat. I had left the boat in a rush, thinking I'd be gone only for 8 weeks, but everything was OK and there were no big problems with the boat in the meantime. 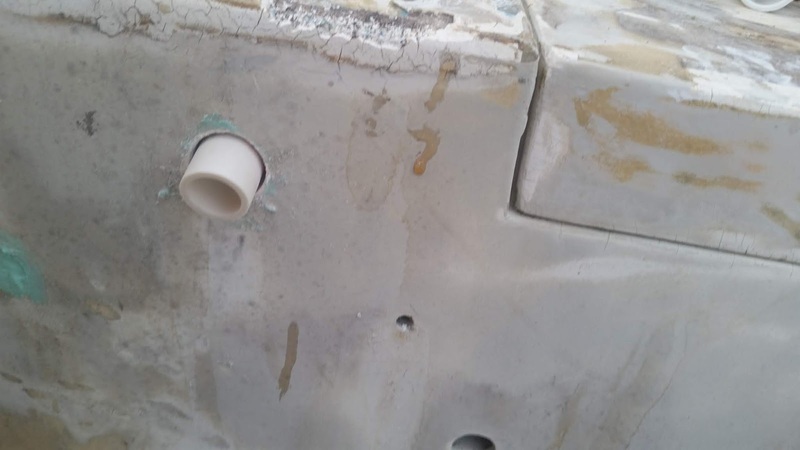 There was no mold inside, thanks to the new interior paint job with the anti-mold additive, and also thanks to my friends who aired-out the boat for me on a regular basis. 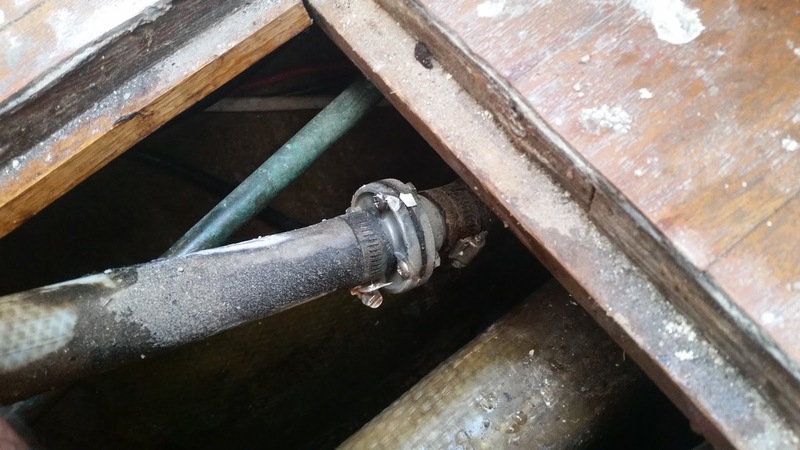 About 20 gallons of water hd accumulated in the bilge - more on that later. 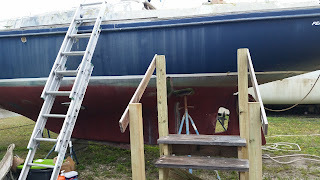 And the epoxy primer I had put on the deck will need to be redone (it did not fair well under the beating Florida sun, and was cracking/peeling) but that's not really a big deal either. All in all, I am happy to be back! 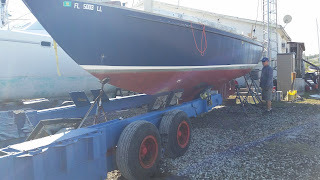 The first job was to have the boat moved from where the yard management had stored it, to better spot with more room for a workshed This took a few days but was done by Thanksgiving. The next immediate project was to make a temporary replacement for the fore hatch lid that had blown off in the last hurricane. 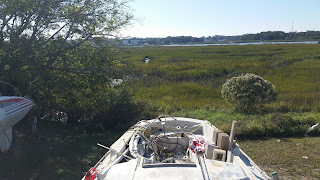 I had covered the hatch with a piece of PVC board, weighed down with my anchor and windlass, and this had worked for the 15 months of my absence but was now impractical since I couldn't open and close the lid easily. I had to make a quick-and-dirty, slap-dash replacement hatch without my tools or supplies that were still in my storage unit. Making the temporary hatch was a quick job: Put some plastic sheeting over and around the hatch, drape the fiberglass cloth over it and then wet it out with resin. Repeat a couple of times, then after the fiberglass cures, just lift off the new lid and trash the plastic sheeting under it. The result wasn't pretty but it does the job for now. Hello to my readers in Israel שלום לקוראים הישראלים ! לאתר שלי יש ביקורים רבים מישראל, אז שלום! ברוכים הבאים לאתר שלי! מקווה שאתה לומד הרבה.